St. George Island Volunteer Fire Department – a volunteer, non-profit fire, rescue and EMS department with a primary response area of St. George Island, Florida. OUR MISSION STATEMENT: THE SAVING OF LIVES, THE PROTECTION OF PROPERTY FROM FIRES AND OTHER DISASTERS, MEDICAL RESCUE, WATER RESCUE AND PROMOTING THE TEACHINGS AND PRINCIPLES OF FIRE PROTECTION AND PREVENTION. 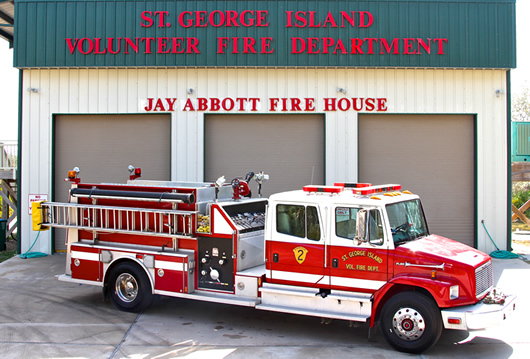 The St. George Island Volunteer Fire Department is a 24-member, volunteer, non-profit fire, rescue and EMS department with a primary response area of St. George Island, Florida. We are fortunate to have a very dedicated volunteer membership — volunteers providing fire, rescue, EMS, administrative and support service to our community every month. Interested in volunteering with the SGIVFD? Click here to contact us.